The LD600 Series has been discontinued, please see the LD620 series as a possible substitute or consult OMEGA's Pressure Engineering department. 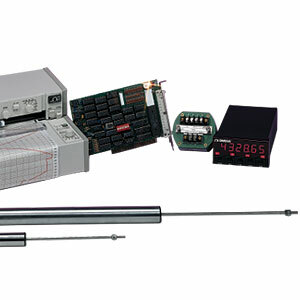 The LD600 Series provides our longest stroke length (for dc powered transducers) to a total of +/- 300 mm (12 inches). Our custom hybrid IC, composed of an oscillator/ demodulator and filter, requires dc excitation and provides a linear mV signal proportional to displacement. The built-in electronics enable extremely simple systems to be set up. The mV/V output is compatible with all dc metering, recording and data interface devices. The transducers are provided with a spring-return armature for easy installation. The inherent long life, infinite resolution and excellent repeatability of LD600 Series transducers makes them highly suitable for many varied and demanding applications.